KUALA LUMPUR: Saturday 3rd - Sunday 4th August, 2019. The venue for the Kuala Lumpur Round is at The Garden's Theatre. PENANG: Friday 9th (For the Juries' concert) & Saturday 10th August (Competition). The venue for the Penang Round is at Komtar Auditorium (A). The Application deadline is 15th July 2019. Note: Selected candidates will be notified of their time and dates of the competition through email. Additionally, the contestants' names will be listed here after 25th of July. 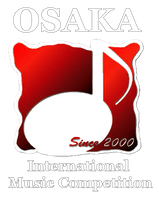 October 5th: Amateurs (Virtuoso, POA Course) at Muramatsu Recital Hall Shin-Osaka. October 5th: Amateurs (Superior, Excellence, Senior, Silver, Duo/Ensemble Course at Abeno Kumin (Ward) Center Small Hall. October 6th: Youth Free Programme (Junior & Infant "C" courses) at Muramatsu Recital Hall Shin-Osaka. October 6th: Youth Repertoire (Junior & Infant Courses) and Youth Free Programme (Infant A & B courses) at Abeno Kumin (Ward) Center Small Hall. October 9th: Two Pianos, Four Hands & Piano Age-G at Muramatsu Recital Hall Shin-Osaka. October 10th: Early Music at Muramatsu Recital Hall Shin-Osaka. October 11th: Piano Age-U at Muramatsu Recital Hall Shin-Osaka. October 11th: Wind Instruments Age-U & H and Duo/Ensemble at Abeno Kumin (Ward) Center. October 12th: Piano Age-E3 & H at Muramatsu Recital Hall Shin-Osaka. October 12th: Strings Age-U & G, Folk Instruments and Wind Instruments Age-J & G at Abeno Kumin (Ward) Center. October 12th: Concerto Audition and Recital Course at Uhara Hall. October 13th: Piano Age-E1, E2 & J at Muramatsu Recital Hall Shin-Osaka. October 13th: Strings Age-E1, E2, E3, Age-J & H and Harp at Abeno Kumin (Ward) Center. October 13th: Vocal Music at Uhara Hall. Note: The above schedule may change with notice to all contestant. Section I & II - October 14th at Takatsuki Gendai Gekijo Middle Hall after the Grand Final Gala Concert. Section III - October 5th & 6th at Muramatsu Recital Hall Shin-Osaka, Abeno Kumin (Ward) Center Small Hall . Award Ceremony will take place at the judging venue on the day of judging. Note: Please do not hesitate to contact us should you have any questions regarding the venues.